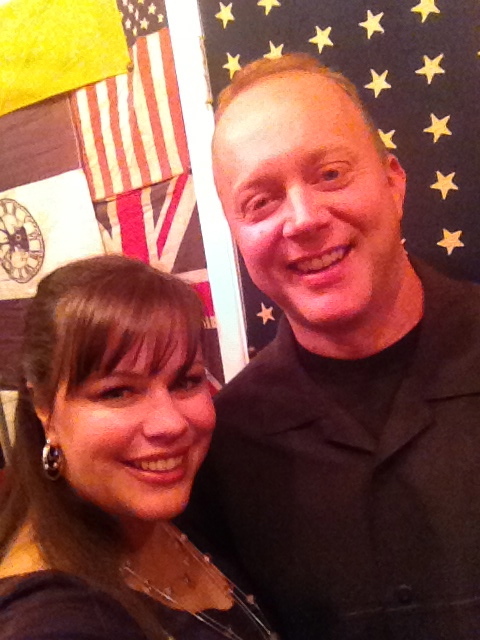 This weekend Music Man and I had the rare privilege of going to a Hollywood party (i.e. 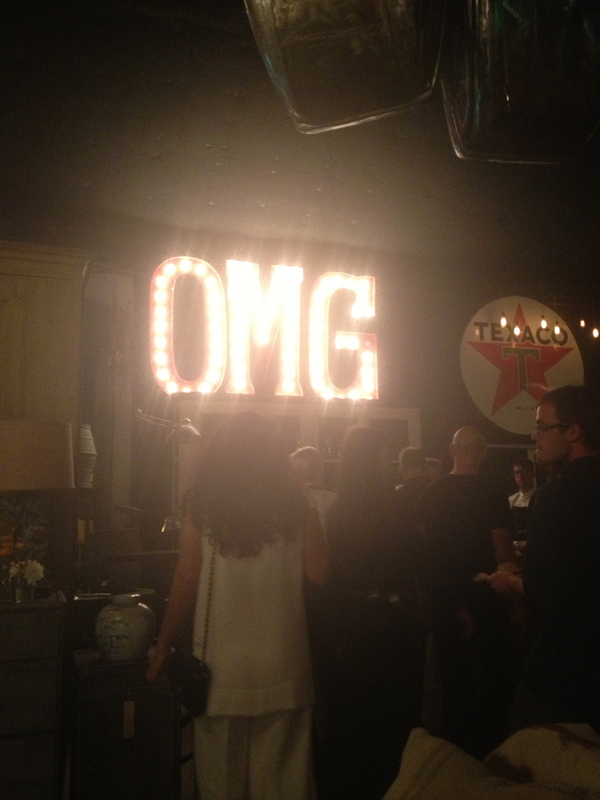 : fancy gathering of people who work in Hollywood). This time it wasn’t just for a Wrap party (a party to conclude the end of a television season. Often happens once a year), it was for a major television composers 50th birthday! This is one of Music Man’s direct bosses, so it was an honor to be invited. That being said, I don’t always enjoy these types of affairs. Its like going to someone else’s annual Christmas work parties, or better yet, your spouses high school reunion. Will you know anybody there? Not too many. Will you have anything in common? Not really. Will you get any of the inside jokes that might be told all night? Nope, not at all. So while it might be fun to get a little more dressed up than my usual yoga pants and t-shirts and a night without the little ones, its still a bit stressful. A friend once aptly described this classic situation as FUNDATORY. FUN-DATORY = Mandatory fun. A mandatory event that you are encouraged and required to have as much fun as you can muster. Beginning of the night classic selfie with me and my man. After cursing our way through infamous downtown LA traffic (with the way anxious Music Man was driving, we barely made it out alive people! ), we finally arrived at our destination. A hole-in-the-wall antique STORE. We were having a party at a store. Which at first seemed weird and sketchy, but once we walked in we realized just how cool it really was. First of all the decor was up my farm house ally. It was littered with second hand or antique furniture pieces and decor. And best part? You could BUY ANYTHING you wanted! Practically everything standing still had a price tag on it. Granted you would have to have the wallet of a major Hollywood player, which of course we are not, in order to afford it. We were mere peons in the ocean of who-who’s in the Hollywood musical elite at the party. No matter, it was an antiquers dream window shopping experience. 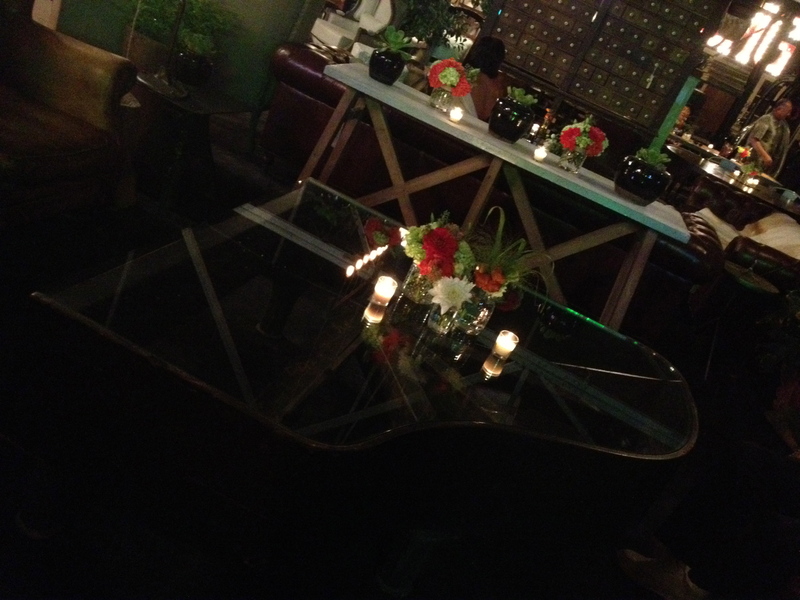 It’s difficult to see, but this coffee table is actually in the shape of a baby grand top. It was by far my favorite piece. Wish I had the moola to nab this beauty. 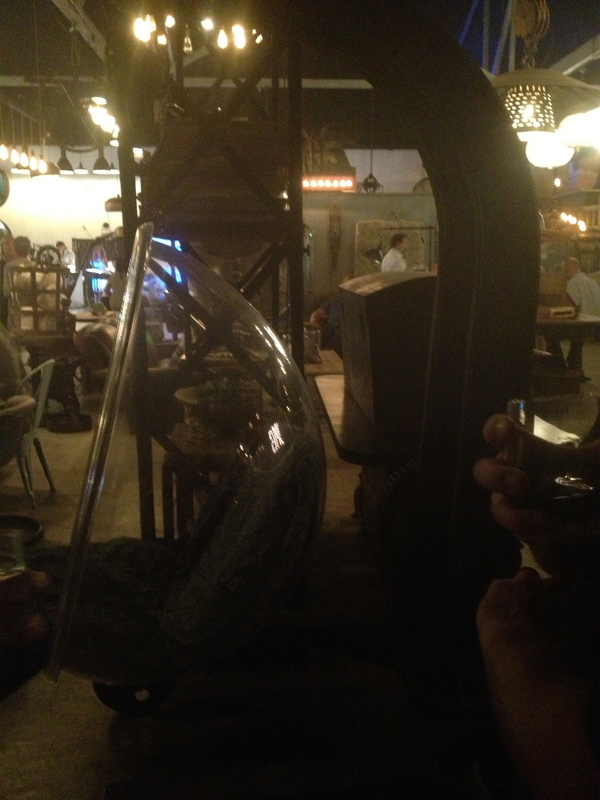 Again, sorry its difficult to see, but for a mere $16,500 you too could have this crazy half bubble chair with a medieval wrought iron with crank power in the back. The picture does not do it justice. 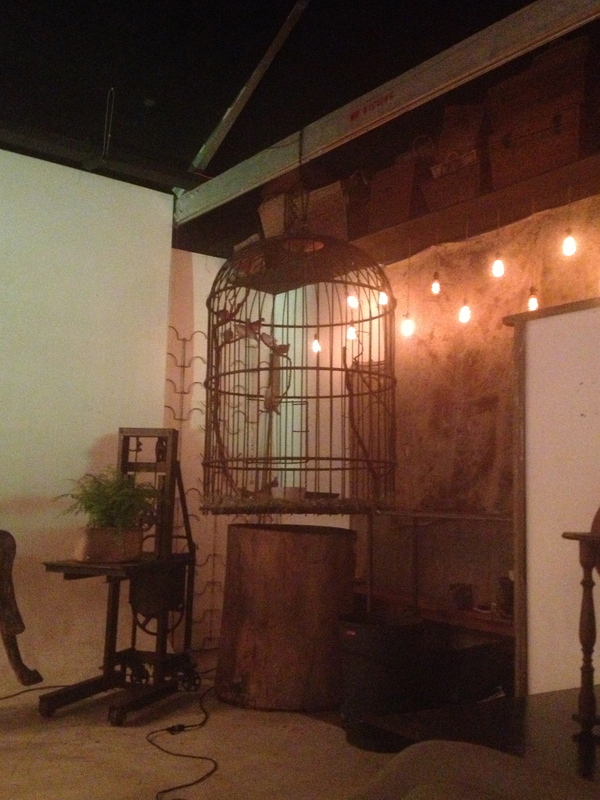 There were several GIANT bird cages for decoration and low and behold there were actual birds in them! To give it perspective, That black part at the top? Its the ceiling. I estimate that the bird cage was about 6 feet high. And this wasn’t even the most dramatic. 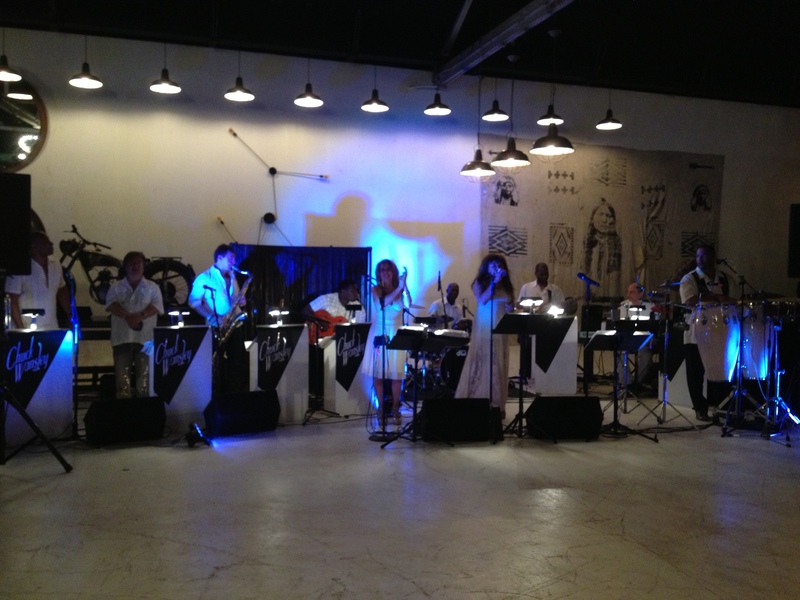 Here was the 12 piece band for our entertainment. It was fabulous. They did old favorites and pop classics from the works of Michael Jackson to Adele. I wouldn’t have expected anything less from the talented guest of honor’s party. And here we are being our usual goofy selves in the prop filled photo booth. So fun. Only complaint? Everybody was sweating like marathon runners in the extreme humidity at the venue. There was no air circulating, which was very necessary considering that it has been in the triple digits and had only dropped to the low 90’s at 10 o’clock at night. Its always a classy move to dab your dripping sweat with your cocktail napkin, right? Well, at least I wasn’t the only one. The ambulance had to come to help a valued party goer who unfortunately passed out. Don’t worry, after a glass of water and some air, he was fine. Our “fall” Fundatory date went smashingly well.